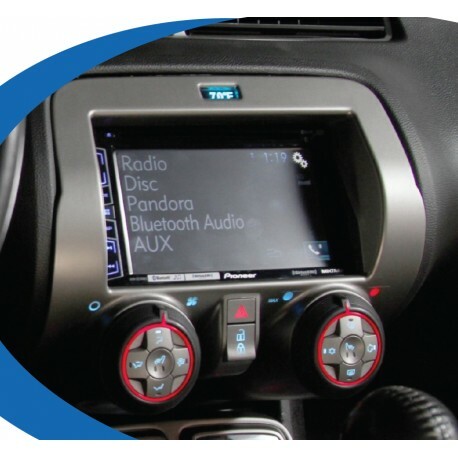 Works in all 2010-2015 Camaros, with or without MyLink factory radio. Does not retain factory satellite radio. PAC-UP required to configure vehicle settings. If not updated, download and install the latest version of the PAC-UP firmware. It is VERY important that you use the latest version of Interface Updater. Not doing so may damage the interfaces software. If this is the first time, run and install "Interface Updater Setup". This will install "Interface Updater" onto the computer. The "Interface Updater" will update the files from the computer to RP Interface. Connect the PAC-UP to the computer using supplied USB cable. Connect the PAC-UP to the RP Interface. Open the Interface Updater Program by going to Start >All Programs >AAMP of America > Interface Updater. Click "Connect" button to establish connection between the PAC-UP and the computer. The "Connected" check box will be checked if successful. If unsuccessful, reconnect PAC-UP to the computer and restart the software. Select your RP Interface from the "Interface select" pull down menu. Click "Update firmware". The new firmware can be found where you saved it before beginning. Once the files are chosen the update will begin. When successful it will show the text "End Update". IMPORTANT: It is very important that the second and third digit of the revision number on your module matches the second and third digit of the new firmware file revision number. If your numbers do not match, please contact our tech support department. Software designed to change the vehicle settings directly from a PC. A PAC-UP interface is required to use this software. Simple yet effective, RPK5-GM4101 is designed to enhance functionality through aftermarket radio upgrades, without sacrificing the factory-look aesthetics of 2010-2015 Camaros. Everything included, installers enjoy an unmatched ease of installation. Supporting both single DIN and double DIN installations, the original rotary climate control knobs are kept in place, helping retain the original factory look and feel. Along with climate controls, the electronic interface module also keeps other important functions from the original factory equipment such as steering wheel controls, OnStar functionality, and amplified sound systems.